Innotec of WI, Inc. custom die-cut capabilities offer pre-cut pieces of double coated tape from ultra thin to foam on a roll that has an extended liner for easy removability. This allows easier and faster assembly during application. 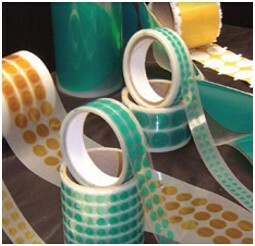 Innotec of WI, Inc. offers die cut tape products for a wide variety of applications. 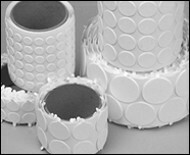 Die cuts can cut production costs by providing a precise pre-cut piece of tape or cushion that needs no trimming to fit. 248DR Green, polyester disks are produced from a high temperature film tape and have a silicone adhesive with excellent release properties that will not leave an adhesive residue. Same tape in rolls as JM887 3.3 35 oz. Silicone High temperature masking for powder coating, anodizing and plating. 456DR Beige, paper masking disks are produced from a high temperature and strength masking tape. It offers a clean removal rubber-based adhesive. 7.7 29 oz. Rubber Highly conformable, solvent resistant, low temp powder and liquid coating applications, used as a mask for industrial painting. 501DR Amber, polyimide disks are produced from a high temperature film tape and have a silicone adhesive with excellent release properties; same tape in rolls as JM511 2.5 25 oz. Silicone Wave soldering mask, masking for high temperature powder coating, masking of PC boards. Bumpons Clear, polyurethane bumper disks with a high tack acrylic-based adhesive 0.335 100 oz. Acrylic Protect backs and bottoms of awards, crystal, plaques, scrapbooking and picture frames from scratches. Felt Green, felt disks with a high tack rubber-based adhesive 61.25 60 oz. 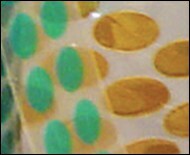 Rubber Protect backs and bottoms of trophies, plaques, scrapbooking, crystal and picture frames from scratches and scuffs. Hook & Loop Black or white, hook (male) and loop (female) with a high tack acrylic or rubber-based adhesive; same in rolls as Hook & Loop n/a 50 oz. Acrylic/Rubber Pre-cut disks are perfect for securing signs, frame moldings, pictures, plaques, scrapbooking, card making and presentation folders for display.